Every Monday and Wednesday evening, OIC’s educational programming reaches out to our community to meet their needs. All Non-native English speaking community members are welcome to participate in our English as a Second Language adult education courses. Conversational English classes meet Mondays from 5:30 p.m. – 7:30 and Wednesdays from 5:30 p.m. – 7:30 p.m. Participants are welcome to drop in at any time and join in on the conversation. Classes will simulate real life experiences. Students learn and develop English skills needed in everyday life. Examples of crescendos may include an improvisational conversation conducted at a bank or at a restaurant. 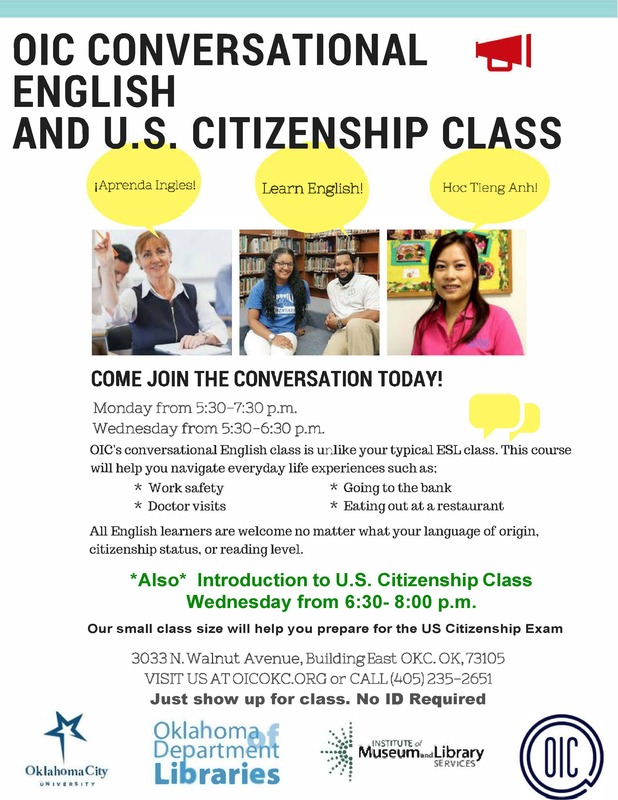 Every Wednesday Citizenship courses will follow after the Conversation English Course. A Path to Citizenship courses Wednesday 7:00-8:00 p.m.